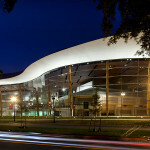 Bing Thom Architects Takes the Stage in Washington, D.C. - Archpaper.com Bing Thom Architects Takes the Stage in Washington, D.C.
Bing Thom Architects Takes the Stage in Washington, D.C.
A timber-backed glass facade provides transparency, acoustical isolation, and resiliency for a historic theater complex in the nation’s capital. 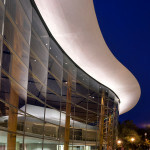 When the Mead Center for Performing Arts in Washington D.C. hired Vancouver-based Bing Thom Architects to double the institution’s square footage without disturbing two historic theaters designed by treasured architect Harry Weese, it was clear to firm principal Michael Heeney that standard solutions would not suffice. For one, the theater facilities were insufficient and outdated. More troublesome, however, was the fact that passenger jet liners taking off and landing at Regan National Airport across the Potomac River were so loud they were interrupting performances. 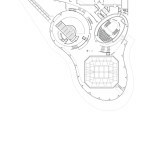 The architects had to find a solution to mitigate this cacophony both for the existing structures as well as for the expansion—a new theater called Arena Stage. “We had to achieve acoustical separation and isolation from exterior noise in a way that was respectful and maintained the integrity of the original structures,” Heeney told AN. 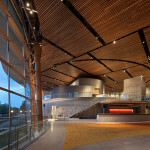 Building off an approach that originated from a project in Surrey, British Columbia, the design team decided to wrap the triangular-shaped complex in glass with timber column supports, topped off with a 500-foot cantilevered roof. 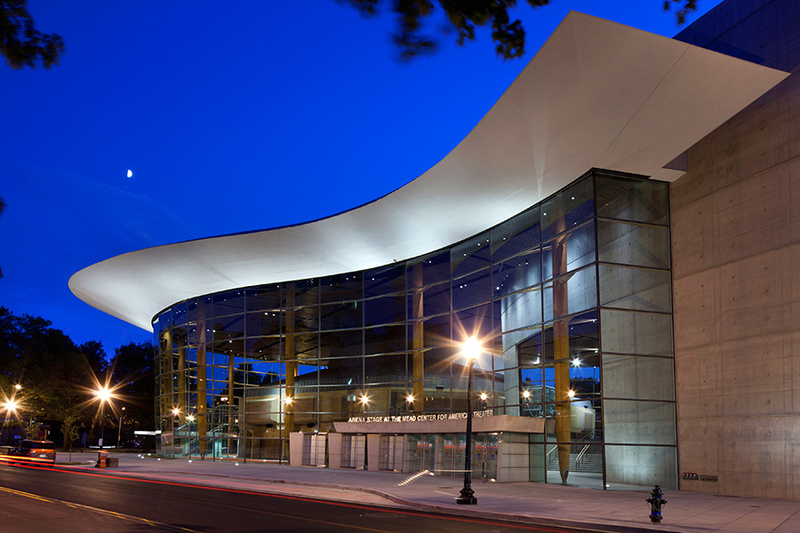 With the help of structural engineers at Fast + Epp and facade consultancy Heintges, the team extrapolated the Surrey solution to provide even greater transparency for the existing Weese theaters, Arena Stage, and a variety of mixed use spaces totaling 200,000 square feet. 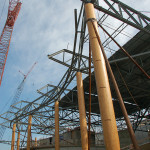 The system features a series of columns milled from parallel strand lumber to taper at the base with an ellipse-shaped section. 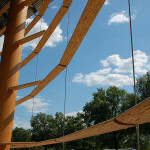 Each column stands between 45 and 63 feet high with a diameter of 22 by 32 inches. 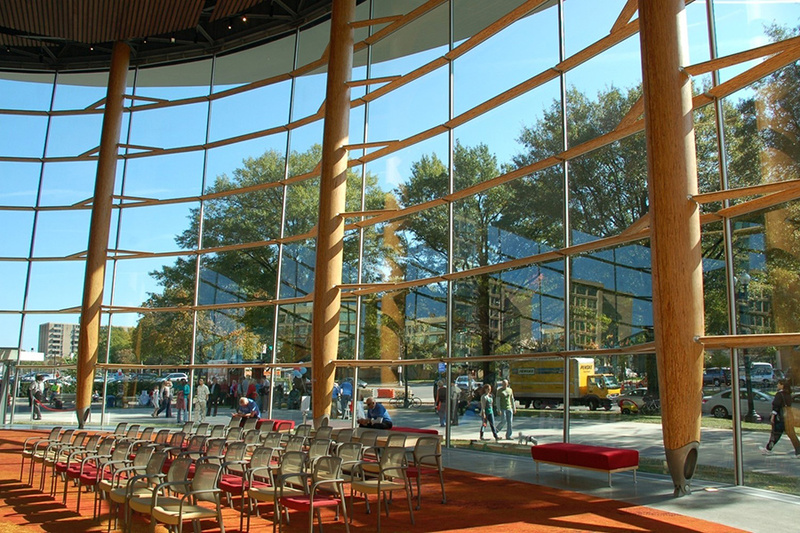 Spaced on 36-foot centers, the columns effectively support the dead load of the glass curtain wall in addition to the weight of the roof overhead. 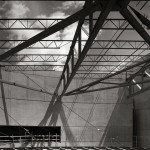 The total perimeter of the complex measures approximately 650 feet in length. 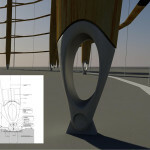 The base of each column tapers to a painted cast iron base featuring an ellipse-shaped cutout. “There’s enormous force coming down through those columns, but we articulated it gracefully like a ballet dancer en pointe,” said Heeney. 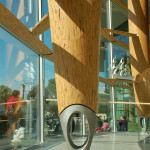 The columns tilt four degrees to minimize glare. 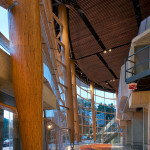 According to Heeney’s estimation, the Mead Center’s large-scale commercial timber-backed glass facade was the first of its kind in the US and has performed beyond the designer’s expectations. When a 5.8-magnitude earthquake rattled the D.C. area in 2011, the glass curtain wall swung with the earth’s motion and then settled back into place. 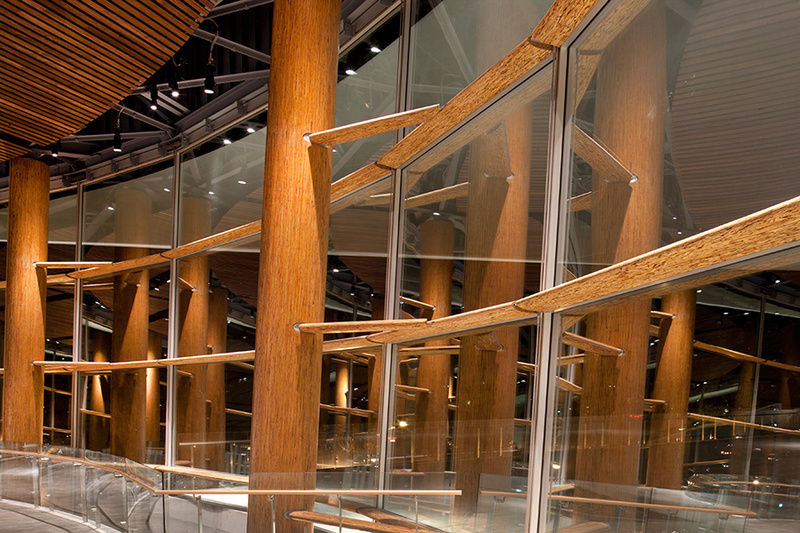 “Even though it’s not seismically designed, I think the West Coast designers’ inclinations made it inheritantly stable,” Heeney mused. 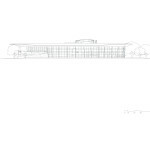 Bing Thom Architects Facades Heintges StructureCraft Washington, D.C.